Monitoring Prostate Specific Antigen (PSA) serum level is the best way to follow Prostate Cancer (PC) patients after treatment and to detect early recurrence of the disease . In case of biochemical relapse (PSA>0.2-0.4 ng/mL), Imaging should be able to detect the site of recurrence in order to establish a correct and tailored therapeutic strategy. It is crucial to distinguish between the presence of local failure and/or distant metastasis . The Conventional Imaging (C.I. : Bone Scan; Computed Tomography or Magnetic Resonance) accuracy is limited in this field as reported by many authors [3, 4, 5, 6]. The site of distant recurrence, mainly lymph-nodes or bone lesions, is thus, rarely detected. In the clinical daily practice it results in an enormous number of negative or inconclusive investigations performed in this setting of patients. Choueiri et al  tried to identify, in 292 patients with biochemical failure, clinical parameters that were predictive of positive Imaging studies, that could be helpful in guiding clinicians in their requests. Authors found that age, imaging type Computed Tomography (CT), Magnetic Resonace (MR), Bone scan (BS), PSA and PSA doubling time (PSAdt) were significantly associated with positive imaging results. However, CT, MR and BS were not useful when PSA was lower than 5 ng/mL and PSAdt greater than 10 months. Summarizing, C.I. showed a sensitivity of only 11% (31/292) with a mean PSA value of 23 ng/mL in the group of positive patients. In a similar study published by Okotie et al , the authors addressed their attention to the influence of PSA and PSAdt on CT and BS sensitivity. Bone scan was positive in only 11% and CT scan in only 7% of the patients. The low accuracy shown by C.I. has meant that the attention of several authors has been directed to other imaging techniques and molecular imaging in particular. The study of tissue metabolism using PET/CT could play an important role in this context . In the field of prostate cancer, many studies have been addressed to this aim in the early past since the first study published by Hara et al in 1998  about the potential use of 11C-choline in prostate cancer patients. In this section we will try to highlight the potentials, but also the limitations shown by 11C-choline in this field. The first large and prospective study was performed by Picchio et al  comparing 11C-choline PET with 18F-FDG PET results in 100 prostate cancer patients with a biochemical recurrence (mean PSA value 6.57 ng/mL). 11C-choline PET detected areas of abnormal uptake in 47% of patients, while 18F-FDG PET in 27% of patients. None of FDG positive was negative at 11C-choline. C.I. (BS and MR) were positive in 49 patients. The study stated the utility of 11C-choline PET/CT in the restaging of prostate cancer patients after relapse: in particular the authors affirmed that 11C-choline PET resulted to be superior to 18F-FDG PET and complementary to C.I., providing almost the same sensitivity as C.I. but by performing a single examination. It is worth to underline however that this study was performed with PET only scanners and not with PET/CT. In the following years many studies focused their attention to the correlation between the detection rate of 11C-choline PET/CT and the serum PSA levels. Krause et al  evaluated with 11C-choline PET/CT sixty-three prostate cancer patients with biochemical relapse after primary treatment (mean PSA 5,9 ng/mL). They demonstrated a significant and strict correlation between 11C-choline PET/CT detection rate and PSA serum levels: the detection rate was 36% for a PSA value <1 ng/mL, 43% for a PSA value 1-<2 ng/mL, 62% for a PSA value 2-<3 ng/mL and 73% for a PSA value >or=3 ng/mL. The overall detection rate for PET was 59%. The influence of other clinical and pathological variables also was evaluated in order to better select patients which should undergo 11C-choline PET/CT. Giovacchini et al  published the results of their investigations on 358 prostate cancer patients (mean PSA 3.7 ng/mL): they found that in multivariate analysis not only PSA levels, but also advanced pathological stage, previous biochemical failure and older age (> 65 y) were significantly associated with an increased risk of positive 11C-choline PET/CT findings. In 2009, Castellucci et al  for the first time investigated the relationship between 11C-choline PET/CT detection rate and other PSA derivates in particular PSA kinetics (PSA velocity: PSA vel; PSA doubling time: PSAdt). Authors enrolled a total of 190 patients after radical prostatectomy (RP) who showed an increase in PSA (mean 4.2 ng/mL; median 2.1 ng/mL). The study showed an overall detection rate of 38.9%. PSA values, PSAdt and PSAvel values were the only parameters who showed a statistically significant difference between patients with PET-positive and PET-negative findings. Authors conclude that PSA kinetics should always be taken into consideration before performing a 11C-choline PET/CT in patients with biochemical failure because it is the most relevant positive predictive factor. Later on, another study by Giovacchini et al  confirmed these data. They evaluated the influence of PSAdt in 170 patients studied with 11C-choline PET/CT after RP who showed a biochemical failure (mean PSA 3.2 ng/mL). The study showed an overall detection rate of 44% and an overall accuracy of 88%. Multivariate logistic regression found that high PSA values and short PSAdt were the only significant predictors of positive 11C-choline PET/CT scan. Moreover, their results demonstrated that PSAdt can distinguish between patients with pathological 11C-choline uptake in the skeleton from patients with pathological 11C-choline uptake in the prostatic fossa. Since kinetics of PSA has been found to be the most important factor in predicting a positive 11C-choline PET/CT, Castellucci et al  have selected a population of 102 consecutive patients previously treated with radical prostatectomy (RP) and who presented only a mild increase of PSA levels <1.5 ng/mL. The aim of the study was to determine if 11C-choline PET/CT could be used also in patients with low PSA values but fast PSA kinetics, i.e. early after biochemical recurrence when the clinical usefulness of the investigation should be maximal. Overall, 11C-choline PET/CT showed positive findings in 29 of 102 patients (28%). What resulted very interesting was that the mean PSAdt in PET-positive patients was 4.34 months while in PET-negative patients it was 13.30 months (p = 0.0001 ). Moreover, only 2 out of 56 patients (3%) with slow kinetics (PSAdt <7.2 months) resulted positive at 11C-choline PET/CT versus 27 out of 46 patients (58%) with fast kinetics that resulted positive at 11C-choline PET/CT. Authors concluded that 11C-choline PET/CT could be suggested early during biochemical relapse in patients presenting with fast PSA kinetics. Fig.1. 68y.o. patient. Prostate Cancer T3aN1Mx. Biochemical relapse two years after radical prostatectomy. PSA = 1.3 ng/mL at the time of 11C-Choline PET/CT. PSAdt = 3 months. 11C-Choline PET /CT detected a single positive lymph-node in the left iliac chain. a) CT images, a small sub-centimetric LN is evident in the left iliac chain b) focal increased uptake of 11C-Choline in the left iliac chain c) fused images d) MIP. As remembered above one of the sites more frequently involved by metastatic lesions from prostate cancer is the skeleton. However only few studies have performed a direct comparison between the accuracy of 11C-choline PET/CT and the one of Bone Scan in the detection of bone lesions. Fuccio et al  studied with 11C-choline PET/CT twenty-five patients who presented a single finding that was classified as equivocal or suspected for metastatic lesion at BS. Authors found that 11C-choline PET/CT detected unknown lesions in 11/25 (44%) patients. Very recently in a larger study, Picchio et al  studied 78 patients with biochemical progression (mean PSA 21.1 ng/ml) with 11C-choline PET/CT and BS. Authors found that equivocal findings occurred in only 1 of 78 (1%) cases in 11C-choline PET/CT and in 21 of 78 (27%) cases in BS. Depending on their attribution as either positive or negative, the ranges of sensitivity, specificity, positive predictive value (PPV), negative predictive value (NPV) and accuracy for 11C-choline PET/CT were 89-89%, 98-100%, 96-100%, 94-96% and 95-96%, respectively. For BS they were 100-70%, 75-100%, 68--100%, 100-86% and 83-90%, respectively. Concordant findings between 11C-choline PET/CT and BS occurred in 55 of 78 (71%) cases. Fig. 2. Authors conclude that for its high specificity, 11C-choline PET/CT positive findings may accurately predict the presence of bone metastasis (BM). The promising results largely reported in the use of 11C-choline PET/CT suggested a more extensive use of such technique in the clinical setting. 11C-choline PET/CT can be used to guide aggressive and tailored therapies in selected patients, particularly in those showing few metastatic sites detected by 11C-choline PET/CT. Two different approaches are possible: surgery (performing Pelvic Lymph Node Dissection: PLND) or Radiation Therapy (EBRT, IMRT). The first study evaluating 11C-choline PET/CT as a guide for PLND has been published by Scattoni et al. in 25 prostate cancer patients, who resulted to be positive at 11C-choline PET/CT (21 pts) or at MR (4 pts). Mean PSA value was 1.98 ng/mL. Validation of results was performed by histology after surgery with a mean number of 21.9 nodes per patient removed (range: 4-74). Authors found that 19/21 patients (90%) with positive 11C-choline PET/CT had nodal involvement at histological evaluation, while none of the 4 patients with negative 11C-choline PET/CT had nodal metastases. 11C-choline PET/CT sensitivity, specificity, PPV, NPV and accuracy were 64%, 90%, 86%, 72%, and 77%, respectively. The low NPV seems to depend on the limited capability of 11C-choline PET/CT to detect micro metastases. Very recently Rigatti et al  tried to determine whether the removal of positive lymph nodes at 11C-choline PET/CT may have an impact on the prognosis of patients with nodal recurrence after RP. Authors enrolled prospectively 72 patients with no more than 2 positive lymph-nodes at 11C-choline PET/CT. Results are very encouraging since, after a mean follow-up of 39.4 months, the overall biochemical response rate was 56.9%. Preoperative PSA <4 ng/mL and negative lymph nodes at previous RP represented independent predictor of good biochemical response rate. These data confirm, once more, that the early detection of recurrence, when PSA values are low and when metastatic diffusion is supposed to be limited, is crucial to achieve response to treatment. 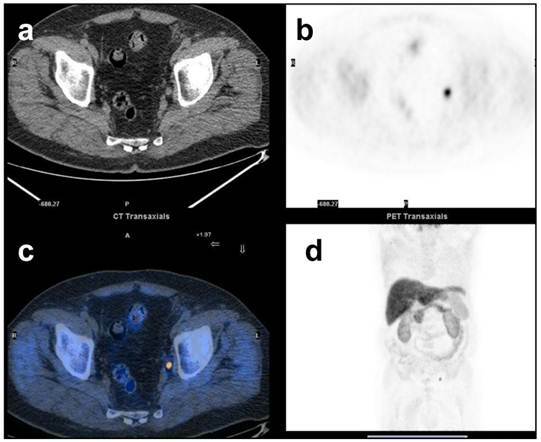 Alongi et al  in 2010, for the first time reported a case of 11C-choline PET/CT-guided helical tomotherapy (HTT) concomitant with estramustine therapy for the treatment of nodal recurrence from prostate cancer in one patient. A dose of 67.2Gy was administered in 28 fractions. At 24 months after the end of helical tomotherapy, PSA was undetectable and no late toxicities were recorded. Authors underlined that a disease-free survival of 24 months, in the absence of any type of systemic therapy, is uncommon in metastatic prostate cancer. Very recently Souvatsoglu, et al  studied the influence of 11C-choline PET/CT on the extent of the planning target volume (PTV) in thirty-seven patients treated with radical prostatectomy and referred to salvage radiation therapy (RT) to the prostatic fossa because of biochemical relapse. All patients underwent 11C-choline PET/CT before RT. They found that 5/37 patients (13%) had a positive finding in the 11C-choline PET/CT, outside of the prostatic fossa (iliac lymph nodes), implicating an extension of the PTV. Overall, at the 51 months follow-up, 56% of the patients had a PSA < 0.2 ng/mL. 76 y.o. patient. Biochemical relapse 9 years after radical prostatectomy. PSA 1,43 ng/mL at the time of the Bone Scan and 11C-Choline PET/CT. a) The bone scan showed focal uptake in the left clavicle and the right pelvis. b) PET/CT also showed 11C-choline uptake in the same > sites, which were evident on CT (pictures c and d). In summary, considering the previous literature and our own experience, we can conclude that 11C-choline PET/CT could represent an important imaging modality in the detection of distant relapses in prostate cancer patients with biochemical recurrence. According to these data, 11C-choline PET/CT could play a crucial role as first diagnostic procedure in patients at high risk of relapse who demonstrate a fast PSA kinetics, even in presence of low PSA values. 11C-choline PET/CT should be more extensively used mostly in order to address guided therapies such as RT (either EBRT, IMRT or Hormonal Treatment) or surgery with PLND. The results of the few studies published so far are very encouraging, since about half of the patients are free from relapse (either biochemical or clinical) for a significant number of months. This could reduce the use of anti androgenic treatments with a significant benefit to the patients in terms of reduction of side effects and, probably, with a significant reduction in costs. Larger studies are needed to confirm these hypothesis. Corresponding author: Paolo Castellucci, MD. & Maria Picchio MD., UO di Medicina Nucleare, PAD. 30, Azienda Ospedaliero-Universitaria di Bologna Policlinico S.Orsola-Malpighi. Via Massarenti, 940138 Bologna , ITALY. Email: paolo.castelluccibo.it Tel.+390516363957 Fax. +390516363956.